Congress and BJP leaders also reached the spot to assess the situation. A three-year-old girl was crushed to death after slabs of an under-construction bus stop fell on her in Gujarat. 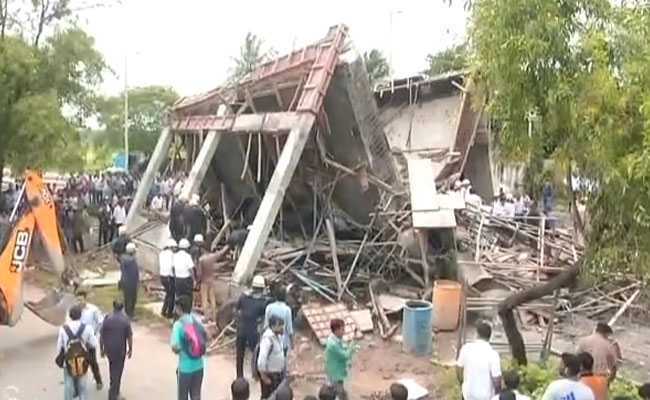 A BRTS bus stop was being constructed near Surat's Anuvrat Dwar and one of its slabs fell, bringing down the entire structure, reports news agency ANI. Around 5-7 people were believed to be under the broken slab. While all others managed to escape unhurt, a girl got crushed under the weight of the slabs. Jagdish Patel, Chief Fire Officer, said, "We received a call around 12:55 pm and sent 4 fire engines and an emergency rescue vehicle at the spot." "The girl, who was under the debris, has been sent to the hospital and we are digging up the site further to find out if there's any other casualty," Mr Patel said.